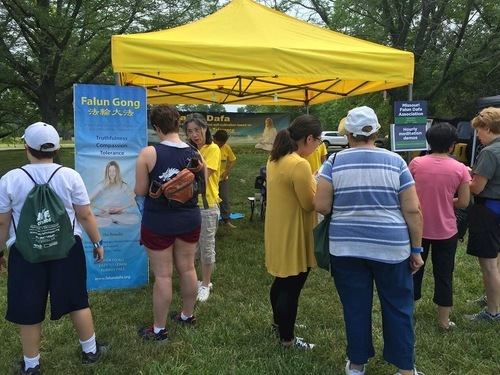 Falun Gong practitioners in St. Louis, Missouri, participated in the 3rd “Life Outside” Festival on Creve Coeur Lake on June 9, 2018. Practitioners have been introducing Falun Gong and exposing the Chinese Communist Party’s (CCP) persecution at this increasingly popular event since its inaugural year in 2016. A steady stream of interested people visited the Falun Gong booth. They said that watching the exercise demonstration made them feel relaxed. Practitioners told them that Falun Gong not only improves health but also one’s character by following its principles of Truthfulness-Compassion-Forbearance. Many agreed that one’s health and spirit are interconnected. A man who watched the second exercise asked for detailed information about learning the exercises and planned to go to a group site. An elderly couple stopped by to talk. The woman, a retired college professor, knew a lot about the atrocities of communism. She said that, through her interactions with Chinese students, she had discovered that the Chinese Communist Party had strict censorship, which left young Chinese students unaware of many social problems and of the Communist Party’s violent history. A practitioner told the couple about the CCP’s attempts to control people’s minds and how Falun Gong practitioners that follow Truthfulness-Compassion-Forbearance are being persecuted, which, in turn, has lead to a crisis of morality in Chinese society. The couple agreed that morality is the basis of freedom.